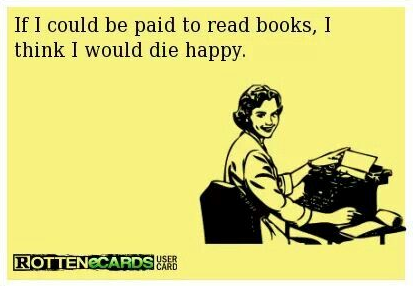 If you already cooperate with a bookstore, e.g. Amazon, Powell's, Book Depository or other (for current bookstores see your Settings) you can connect your affiliate IDs with BookLikes account, and get 100% of the commission set by the seller. We are regularly trying to add more sellers, too. Now, don't worry if you're not familiar with affiliate programs. Getting started is easy and only requires a few clicks. We'll be happy to provide you with a quick know-how in this topic. For your convenience and ours, we'll use affiliate ID and associate ID interchangeably in the following post. Please have a look at step-by-step guidebook of how to use affiliate programs on BookLikes. a. 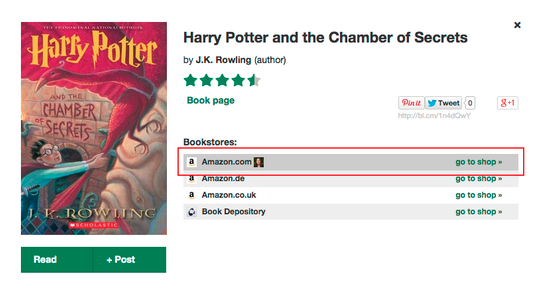 If you're already cooperating with bookstores, add your affiliate IDs in Settings/Affiliate Programs. b. If you're not cooperating with bookstores, visit the bookstores webpages where you can find more information on how to become an affiliate partner. The process is very simple and does not require technical knowledge. You'll be asked to provide your personal data as well as your blog's information, and then your unique Associates ID will be generated. 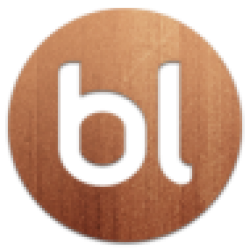 When your IDs are ready, you're all set to connect your BookLikes blog and your Associates IDs in Settings/Affiliate Programs on BookLikes. You don’t have to stick to one program, you can choose several to increase your profit rate. 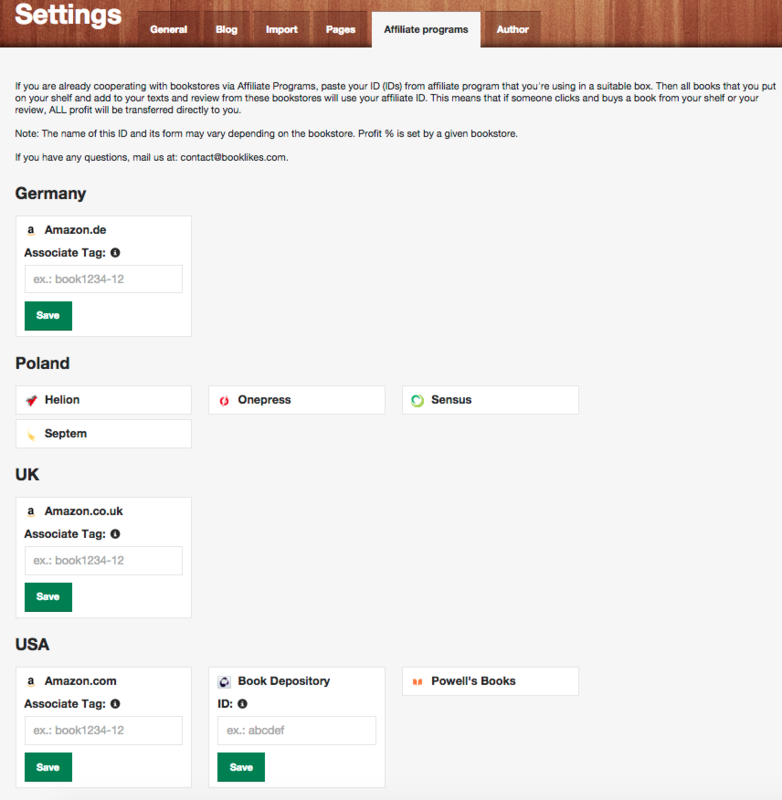 Copy the IDs and paste them in the appropriate affiliate program spots in your Settings. Remember to Save your Settings on BookLikes. When you connect your associate IDs with your BookLikes account in Settings, all books that you put on your shelf and add to your texts and reviews on your BookLikes webpage will use your affiliate ID. This means that, whenever someone clicks the book from your virtual bookshelf or a book review and buys it, you'll get 100% of the commission set by a particular bookstore. Remember that the percentage of a profit is set by a given bookstore and can vary, depending on the affiliate program you're using. Affiliate programs selected by you are highlighted with your avatar in the book windows on your blog and your virtual bookshelf. Each bookstore will provide you with a panel where you'll be able to track your IDs, look through detailed reports about link performance, and check how much revenue did you make. What's important, is the fact that on BookLikes the blogger gets 100% of the commission set by the seller. Yay! Combine your passion for books and blogging with the affiliate programme and generate a revenue. Competent and valuable reviews, not just opinionated pieces, are what really do bring readers to your profile and consequently generate your profile. 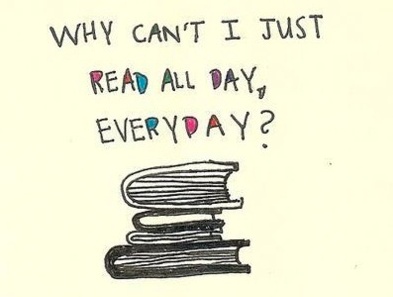 With all that been said, it's totally justified to make a statement: "Yes, I will read all day! ", don't you think? Now all you have to do is read, review and blog.